House of Purgatory is from first time writer/director Tyler Christensen and revolves around four teenagers who go looking for a fabled haunted house on Halloween night. Once found, they slowly realize that the house knows each of their deepest secrets. One-by-one the house uses these secrets against the terrified teens that find themselves in a battle to save not only their lives, but also their very souls. House of Purgatory is another fun and very entertaining film to add to your Halloween season rotation. It has a distinct and spot on 1990's feel as rock/pop music plays over early scenes of high school football games and hallway interactions between the characters. It's a movie that sets up the cocky/know it all yet oblivious and care-free existence of life in high school. This first act of setting up the characters this way makes the events to come that much more effective. Because House of Purgatory is set up like a cruel Halloween trick: bite into the sweetness of this apple and you're going to hit a razor blade. Once the four teens leave a Halloween party to track down this haunted house with urban legend status, the tone of the film shifts gears into a masterful blend of 1950's haunted house spookfests fused with an 80's vibe and 90's look. It's frightful fun as they discover the haunted attraction and begin to walk through it. But Halloween fun turns into a living nightmare as deep secrets of the characters work their way into the displays they encounter and it's clear that this is not a regular haunted house. Some scenes become blurred and washed out, confusing reality with nightmares to the point where the two realms become indecipherable. House of Purgatory becomes a scary story beyond simple ghosts and goblins as the story line progresses. It was refreshing that the characters felt normal and act normal. Anne Leighton as Melanie should be a star, she's wonderful on screen and she was nominated for Best Actress in a feature at the Fear Fete Horror Film Festival for good reason. Aaron Galvin as Nate also puts in a solid performance. The strong acting all around really benefited the film as the characters became more and more distraught and scared as scenarios became more hellish. Fears, guilt, and secrets terrorize the characters as a really smart script connects scenarios from each character in intelligent ways. It's a psychological thriller, a drama, and a horror story all in one. 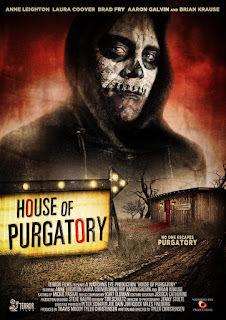 House of Purgatory makes two things clear: haunted attraction films are the new haunted house movies and people are their own haunted houses filled with ghosts they've created. Check out House of Purgatory if you're looking for a new Halloween movie to watch, it's tailor made for this time of year and it hits the nail on the head. With solid acting, good looking Halloween set pieces, and a clever script that seamlessly shifts in tone from fun to scary, the film is a great midnight watch in the dark. And if you have surround sound all the better, it'll sound great!